This is an open-box demo unit. Special gears and levers are making the use simple and easy for all. Physical stress is not needed; you no longer have to use strength to achieve the required tasks. Back pain is a thing of the past! No worrying about charging a battery! Light construction, allows you to carry the lift with you in the car. Raise the client from bed with ease and dignity. 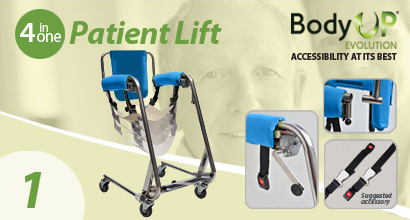 Unlike a classic patient lift, Body Up Evolution is designed to lift you from the bed while your body maintains its natural sitting posture. 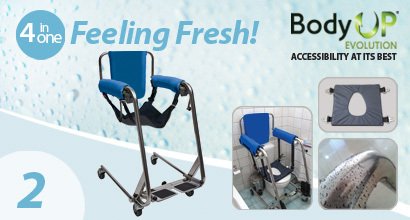 After being raised from the bed, without any additional conversion, client can use Body Up Evolution as a bath/commode chair. Body Up is made of high quality stainless steel that makes it water-resistant. Allows bathing and toileting in the natural, private environment. The bed can now stay clean. 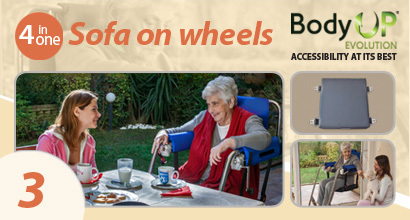 After a client is raised, Body Up Evolution works as an indoor wheelchair or as sofa on wheels! Increase the Body Up width and place clients in their favorite wheelchair. After raising a client from the bed, Body Up Evolution allows easy vehicle access. Clients can ride a vehicle on a daily basis. No expenses for car modifications.